Blog by Artist David Esslemont about design, illustration, printmaking, bookbinding, and publishing – for everyone interested in books and creativity. Nigel Beale aka The Literary Tourist, came to visit and recorded our conversation in which he asked me about the history of the Gregynog Press, my time there as the Controller (artistic and managing director, and printer) of Gwasg Gregynog from 1985–97, and the evolution of Solmentes Press. Listen to the podcast at The Biblio File (link below). Waxing lyrical about the the press's setting amidst the rolling hills of Montgomeryshire, I talk about its founders, the wealthy Davies sisters, some of the key players such as Blair Hughes-Stanton (coincidentally one of my tutors at the Central School of Art), and some of the outstanding books produced there up to 1945, when the press closed. Encouraged by John Ryder and Ian Mortimer, among others, I joined the press from Newcastle upon Tyne where I had been printing and publishing since 1978. It was a significant move, I learnt to speak Welsh, and delighted in the literary and artistic traditions of Wales. Over the course of 12 years I was able to re-open the bindery, re-install hot metal typesetting and Heidelberg cylinder presses, and grow the operation substantially. I enjoyed the opportunity of working with some of Wales' leading literary figures and commissioned many wood engravers to illustrate a wide range of subjects. My favorite book of those I designed and printed was Wrenching Times: Poems from Drum-Taps by Walt Whitman. It was illustrated by Gaylord Schanilec an engraver I met on my first visit to New York in 1990. Many thanks to Nigel Beale for hosting this conversation on his Biblio File podcast. 'In the beginning', and, 'Genesis'. In On heroes, hero-worship and the heroic in history Thomas Carlyle makes several references to the 'divine . . .' and 'sacred Hebrew Book'. In Sartor Resartus he refers to 'young Ishmael' in the 'destitution of the wild desert'. Throughout both books he includes many biblical references and allusions. For my illustrations, I looked for a quotation, and then searched for an original source – and I found Hebrew texts. The history, meaning and beauty of the letterforms are fascinating and I began to draw and learn a little of the Alephbet. The first problem I encountered was the inability of Microsoft Word and Adobe InDesign to render the text as right to left (RTL) reading. Curiously my Firefox browser, Apple Mail and TextEdit did work, which helped when using the Hebrew keyboard layout. Working again on the Stockhausen piece for solo clarinet, In Freundschaft. The installation photo above shows two large paintings together with smaller sketches. 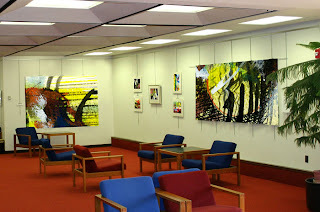 The painting on the right wall measures 96 x 42 inches, while the painting on the back wall measures 72 x 48 inches. These are derived from the "master painting" (67 x 108 inches) seen below. None are intended to be the definitive, or final work in this series, as it still a work in progress. These pieces started life as interpretations or responses to a piece of music, but there comes a point in the creative process where the painting grows and matures and develops a life of its own and leaves the home, so to speak. 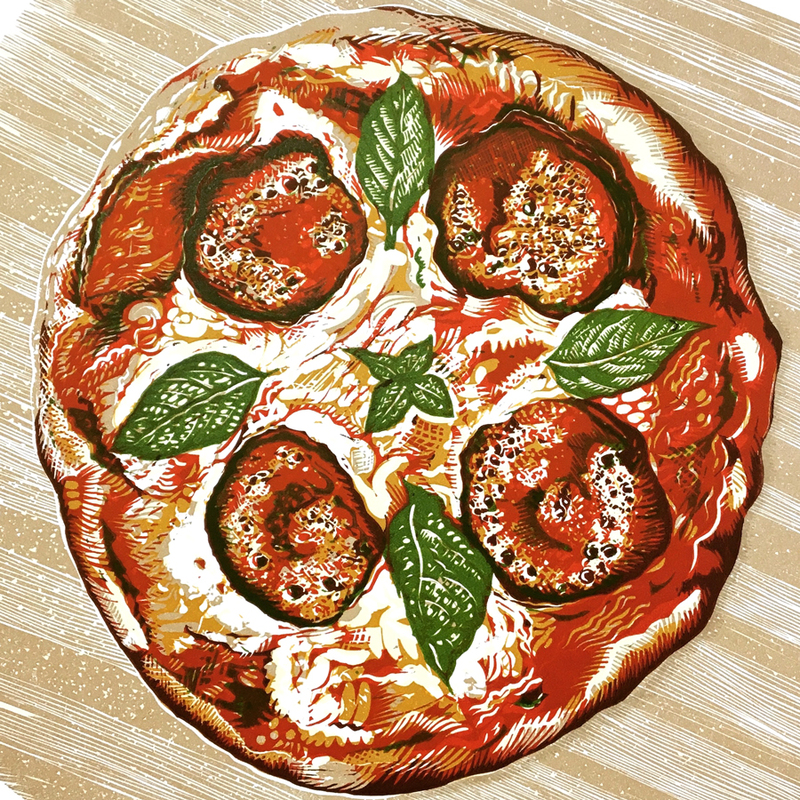 I have an interest in food – okay it’s a passion – actually it’s an obsession: I am obsessed with food and cooking, today it's pizza cooked from scratch in a wood-fired oven. Some of my earliest memories of cooking date back to when I was a Boy Scout: delicious, smoky, crispy outside, soft inside “benders and twisters” – simple wheat flour dough balls stretched around a stick, cooked over a campfire. Later, travels in Italy and the revelation that the Holy Trinity was in fact garlic, tomatoes and olive oil, and the best pizzas where cooked in wood-fired ovens, helped fuel this passion for cooking that become an obsession.